As my garden production comes to an end, I wanted to share a piece of equipment that has made my life much easier. First of all, I must admit that I can understand why our grandmothers embraced the advent of canned goods in the grocery store. Having spent the last few summers canning the fruits of my labors out of my garden, I will tell you that it is exhausting work. It begins with picking the produce; washing and cleaning it; oftentimes boiling, blanching and peeling it; cutting, chopping or slicing; washing the jars and rings; filling them with the fresh food; and tending the pressure canner for sometimes an hour and a half ..... you had better dedicate an entire day to the canning process. No wonder our grandmothers were willing to trade some healthy aspects of the food they served their families for a little convenience and extra time! There is a price to pay for such healthy goodness, and it involves tired feet and an aching back. But all my grumbling aside, I still enjoy the finished product and take great pride in my efforts. That being said, I'm not above finding a tool or implement that will shave off time and make the experience even more enjoyable. That's where the NorPro Sauce Master comes in. 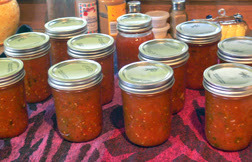 My yield of tomatoes this season was plentiful, and I couldn't wait to can a supply of spaghetti sauce and salsa. 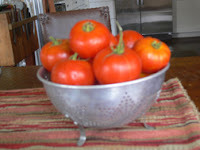 But the step of blanching and peeling the tomatoes was my least favorite part of the process. The Sauce Master helped eliminate the drudgery of that chore. It automatically separates juice and pulp from seeds and skin, with an easy continuous operation, which makes it ideal for home canning, freezing, and dehydrating. 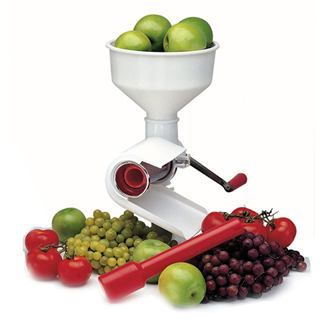 You can use it for the production of tomato juice, fruit butters, fruit leather, applesauce, baby food, pumpkin pie filling, jams and jellies. The best part is that there is no pre-cooking needed for soft textured fruits like tomatoes. The Sauce Master includes a plunger, spout, standard spiral and stainless steel screen, recipes and instructions.... all you need to speed up your canning process. 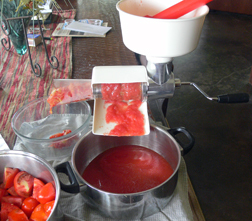 The following pictures will show you how easy it is to prepare your tomatoes and get either more pulp or simply sauce, depending on what you are trying to achieve. The difference is in the use of the different screens ... a finer one will result in more of the tomato being discarded, while the Salsa screen allows you to retain more meat of the tomato and acquire a "chunky" consistency. of the tomato is poured into the pan on the right. Pints of Salsa after coming out of the Boiling Water Canner. the left, and pulverizes tomato into pure sauce. a boiling water bath. It's beautiful! I have read some of the reviews on this product on Amazon, and I can honestly say I disagree with all of them. 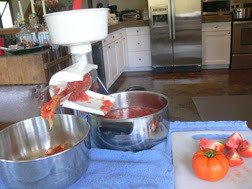 I have found the parts easy to clean, the handle easy to turn, and the resulting tomato product had the consistency I was looking for. 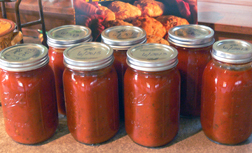 It greatly improved my canning experience and made the whole process much easier and faster. I am anxious to try and make applesauce and jams and jellies. As far as I'm concerned, anything that encourages me to keep canning is worth any little imperfections. And the more spaghetti sauce I have in my pantry, the happier I am! Genesis 1:12 "The land produced vegetation: plants bearing seed according to their kinds and trees bearing fruit with seed in it according to their kinds. And God saw that it was good." (Laughing) Yes, we're almost a world apart in our growing seasons, aren't we? Craig's List is a good place to try and find this piece of equipment. Anything to make it simpler and faster! I love my Sauce Master too. I just began things from my garden last year. It has been such a time saver. I'm all about saving time. Thanks for sharing. How do you get the screen clean? I have used this machine 3 times so far this season and each time I spend an hour trying to get it clean.... any short cuts. Jozana, You're right! There is no easy way to get the screen clean. I usually let it soak in warm soapy water for 15 minutes or so, and that seems to make it easier to remove all the skin, seeds, etc. It is definitely the hardest piece of the equipment to clean, but just part of the process. I just bought the salsa screen and am planning to make salsa. I was wondering if you core the tomatoes before you use them? Also can I run my peppers and onions through the screen and do I need to cook them some before or are they soft enough? 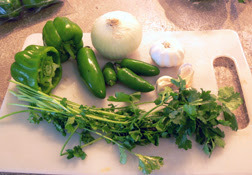 Susan, this is how I make my salsa .... I quarter my tomatoes, run them through the salsa screen. The screen will remove the skins and core and deposit it in a separate bowl. I then add this tomato puree to a pot of sautéed onions, peppers, cilantro and seasonings. I cook it on the top of the stove for 20-30 minutes and then can it. It's simple! I DONT EVEN USE THE SAUCE MASTER.....JUST PALCE INTO HOT WATER FOR 2-3 MIN. THEN PLACE INTO COLD WATER AND PEELING COMES OFF WITH HELP AND THE CORE IT. CRUSH WITH YOUR HAND INTO A STOCK POT AND BOIL WITH EVERYTHING IN IT......FOR 10 MIN.....YOU ALL KNOW THE REST.